The Coalition of United Political Parties (CUPP), has approached Abuja Federal High Court seeking for an order to restrain President Muhammadu Buhari from participating and presenting himself for re-election in the forthcoming February 16, 2019 presidential election over his “mental and physical instability”. Further, the Opposition Coalition declared President Buhari as “mentally and physically unfit to continue in office. 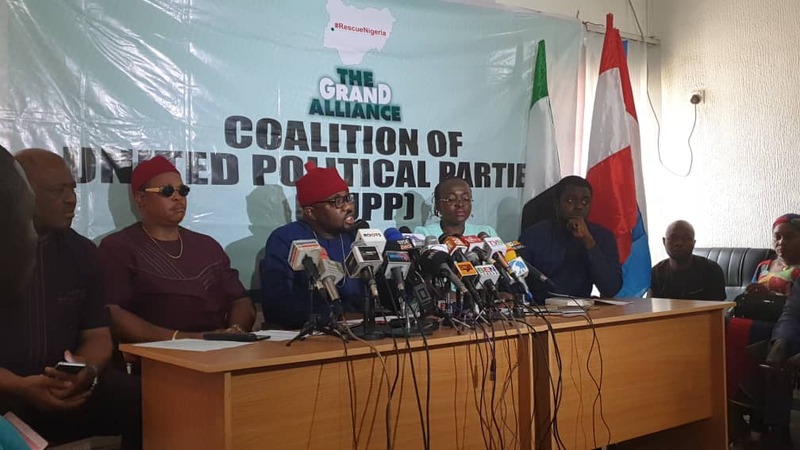 CUPP in a press conference Thursday while buttressing their stand on the health status of President Buhari with instances of failing health, also revealed they have asked the court to compel the President to undergo medical examination which result must be made open to the public. The plaintiffs include Ikenga Imo ugochinyere, Cupp 1st National spokesperson and Co-Plaintiff and Eunice Atuejide, Co- Plaintiff and CUPP member while President Buhari and INEC are defendants. In a statement articulating their grievances, copy of which given to OPTIMUM TIMES, they maintained among other things in respect of 2019 that: Opposition Coalition (CUPP) declares Buhari mentally and physically unfit to continue in office. “Opposition Coalition Commences Legal Action at Federal High Court to stop Buhari from participating in 2019 election over his Mental and Physical instability. “Opposition raises alarm that cabal plotting to continue to rule Nigeria from the dark if Buhari is imposed on Nigerians. “Opposition warns Voters, do not cry to us if you make the mistake of allowing an incompetent and unfit leader return to power. “Its Operation Vote, Stay behind and defend your vote even with your last breath. “Opposition raises alarm over DSS plot to Frame, arrest, charge and eliminate Opposition Spokesperson Ikenga to stop him from releasing fresh evidence of plot to steal N5b from DSS election account by former DG DSS lawal Daura and indicting documents of false assets declaration by key Buhari govt appointees. “Opposition political parties have carefully studied President Muhammadu Buhari over the months, especially since his return to the country after the sickness that took him out of Nigeria for the better part of 2017, and have come to the conclusion that he is no longer mentally and physically fit to lead a nation like ours in this century. “A few days after the Kogi episode, a similar scenario played out at the venue of his campaign rally in Kaduna. After he trekked a short distance to his seat, President Buhari was clearly exhausted. He was still managing to wave to those who were already at the venue when he suddenly sunk heavily into his seat even at a time the national anthem was being recited. The seat was his saving grace on that occasion. “Still on his uninspiring ongoing re-election campaigns, we are all witnesses to the embarrassment President Buhari subjected the country to in Warri, Delta State. When it was time for him to present his party’s flag to the State governorship candidate, Great Ogboru, the President embarrassingly referred to the man as “the presidential candidate.” After those who surrounded him corrected him, President Buhari again referred to Ogboru as “the senatorial candidate.” Again, he was corrected and he came up with the most embarrassing one by saying the man is the “governortorial” candidate. The President must be using a different dictionary because the word “governortorial” does not exist in any good dictionary. “You will also recall when he featured on a town hall meeting called “The Candidates” which was broadcast live on the Nigerian Television Authority. Among his various goofs at that event was when he was asked why he is seeking second term and he said since he party leaders chose him, he had to run. “All those who watched that programme will recall how Vice-President Yemi Osinbajo who featured with him struggled very hard to come to his rescue whenever he goes off the track which he did many times. This probably explained why his men did not allow him to participate in the presidential, debate organised by the Nigeria Election Debate Group and the Broadcasting Organisation of Nigeria. “We have come to the conclusion that re-electing Buhari will only empower members of the cabal that his wife admitted has hijacked his Presidency to rule us for another four years from the dark. “In order to save this great nation the disaster that will follow if President Buhari is in a rare happenstance re-elected, we the opposition political parties have therefore filed litigation in court seeking to declare him unfit to contest for 2019 election because of his mental instability. “We are also seeking from the Court an Order disqualifying President Muhammadu Buhari from contesting the election to the office President of the Federal Republic of Nigeria and an injunction restraining INEC from recognizing his candidacy. “Nigerians will also be glad to know that to prove that we are on the right path, we are also asking the court to grant an order directing President Buhari to make public the results of the medical examination which we ask that he be subjected to so that no citizen will be in doubt that we are saving the country from calamity by taking these steps. “Stopping President Muhammadu Buhari from foisting himself on Nigeria come February 16th by every legitimate means is a patriotic service to Nigeria. “God forbid we fail! God forbid! God forbid! God forbid!